Until the 19th century, not just the Isar River and its natural branches but also the “Stadtbäche”, artificial canals, provided Munich with water for drinking, commerce, waste discharge, defense, ostentatious display and for other functions. In particular, the streams were the main transport route and offered hydropower for many mills and other hydropower-dependent facilities in the Preindustrial and Early Industrial Ages. The Isar—an alpine river—transported large amounts of gravel and would often change its course. Regularly, floods destroyed dams and weirs. A fair distribution of water to all users on both sides of the river was difficult to negotiate because securing constant, reliable flow was one of the biggest challenges water engineers faced. The joint development of Munich and its waters was also influenced by the conflicts between citizens and the Bavarian duke as well as by the city’s simultaneous function as ducal court of the house of Wittelsbach and as administrative centre of Bavaria. In the second half of the 19th century, when Munich became a metropolis, the city’s streams played an important role in the process of urbanisation but also became a growing problem. An unprecedented level of pollution from increasing industrial activities and growing population required action. Solutions had to be found for the many tasks that were fulfilled by the city’s streams. As in many other cities, electricity and railroads as new technologies of the Industrial Age enabled Munich’s inhabitants to replace the essential local functions of the river. The artificial canals could then be filled in and most natural branches of the Isar disappeared below ground. One of the defining characteristics of the city, its unique reliance on canals, had ceased to be. Munich’s early modern urban water network was initiated in the 13th century, subsequently enlarged, and adapted to changing needs many times thereafter. In the 19th century, the water system underwent a fundamental transformation to serve new urban demand, which evolved in the wake of modernization and industrialisation. Numerous and mostly artificial canals which drove mills and other mechanical devices in the city and received the wastes and effluents of town dwellers for centuries were successively filled in or vaulted. Larger open canals that crossed suburbs—gradually integrated into the city limits after 1853—were transformed into sites for hydro-electricity production. The Isar, from which all urban surface waters had to be diverted due to the lack of tributaries within or close to the city boundaries, was systematically channelized. The transformation of the surface water network went hand in hand with the construction of a modern, citywide water supply network and the installation of a sewer system. This transformation was a reaction to population growth and increasing water pollution, to new commercial production technologies, scientific and medical progress, but also to administrative changes and an altered perception of cleanliness. At first glance, the 19th century transformation of Munich´s urban water network followed a trend similar to many European and American cities. In her monograph ‘City of Flows’, Maria Kaika has suggested distinguishing three phases of what she terms ‘modernity’s Promethean project’, which goes hand in glove with industrial growth, capital expansion and the production of modern cities. According to her, the first phase in the early 19th century is characterised by deteriorating social and environmental conditions. Urban rivers became a source of disease and death. Nature seemed to be uncontrolled and undisciplined, impeding further urban development. It was also the moment in which ambitious plans for the control of natural water flows were tabled and projects for water supply and sewerage networks were made. This kind of planning characterizes the second phase of urban modernization which Kaika calls the ‘Heroic moment of modernity´s Promethean project’, lasting until the 1970s (Kaika 2005, here p. 6). Thereafter, nature was largely perceived as a source of crisis following worldwide and serious environmental problems due to increasing water demand and failure of public funding. Kaika termed this third phase ‘Modernity´s Promethean project discredited’. The first and second phases she identifies have received much attention in urban (environmental) history studies. Melosi (2000) has spoken about the ‘sanitary city’ based on his thorough study of US cities while Gandy (2006) describes European urban centres of the 19th and 20th centuries as ‘bacteriological cities’. 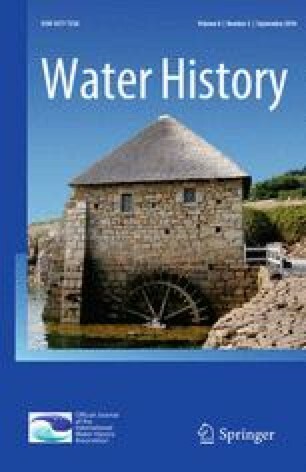 Both terms highlight the challenge water supply and wastewater discharge posed to urban authorities in the second half of the 19th century. The history of water supply and sewage disposal in European cities is likewise well researched (Bauer 1998; Kluge 2000; Platt 2005; Tarr and Dupuy 1988). Coal as a new fuel for transportation contributed to the altered role of urban waters and their transport function. Within just a few decades, between 1850 and 1880, a dense railway network covered central, Western and Northern Europe. Munich became a part of it when the first railway line connected the city to Berlin in 1851 (Pounds 1988). In the introduction to an edited volume on Water and Urbanization, Tvedt and Oestigaard (2014) present a conceptual framework for urban water studies. They emphasize the necessity to study the environmental features of the local or regional water network together with human modifications as well as human perception. Applying their framework, we start with the Isar, as this main river was decisive for Munich’s urban development and had shaped the network of surface waters and its evolution since the late Middle Ages. When Carl Batsch, a Lieutenant of the artillery in the service of the Duchy of Saxe-Weimar-Eisenach, wrote about his travels through Baden, Bavaria, France and Holland in the 1820s, he summarized the main themes of an environmental urban history of Munich with remarkable understanding and clarity. He characterized the Isar as a mountain river with high seasonal dynamic. From late autumn all through the winter and often as late as May, it would carry but little water. Nevertheless, it had to be counted among the wildest and hardest-to-tame rivers, because of its origin in mountain forest creeks. It could swell fast and carry extraordinary amounts of gravel, which it deposited as soon as the streambed widened. During floods, gravel piled up on the fields, rendering them infertile for a long time. The city was mainly built on the left side of the river at the time Batsch described it. While he credited citizens with success in using the Isar, flood protection remained an open issue, and the government was constantly working on it. Batsch understood that the city of Munich was situated on a former bed of the river. He speculated that an unregulated Isar would move further east, wash away the small city of Au, and increase its distance from Munich. Batsch covered the most important themes of an environmental urban history of Munich and the Isar. He discussed the fact that the city was built on the left bank only; the nature of an Alpine River and the hazards it created; Munich’s reliance on artificial canals to use the water’s power without being endangered by it; the maintenance requirements of the artificial network; and the unplanned and therefore, conflicting uses of the canal for machinery of all kinds, a setting that could not be amended easily without changing the urban fabric in its entirety. Batsch held that such a change was impossible. He could not and did not foresee the demise of the influence of the ducal court and the nobility, as he could not and did not envisage the role of railway networks and fossil fuels. The latter increased the ability of urban administrations to commission engineering works markedly. A century later, the aquatic Munich that Batsch had visited, already much simplified from its earlier layout, would be gone. After the turn of the 19th century, nearly all smaller streams and canals were abolished for sanitary reasons and the sewer system was extended continually.1 New patterns of water use had become common. Tap water was available for private houses and factories, the fire brigade could resort to longer hoses and lorries to transport water. Washers could no longer wash linen due to the dirt in the streams. Instead of being an indispensable asset for city life, streams tended now to be seen as a nuisance, a danger to cleanliness and health. Was Munich’s water history unique or does it fit into the usual pattern of industrial urban transformation? In line with the suggestions of Tvedt and Oestigaard (2014) we focus on three thematic areas essential for an environmental history of urban waters to answer this question. We account for the natural characteristics of the surface water network, we look at water system modifications humans had undertaken to benefit from water services and we shed light on ideas and managerial concepts, especially when it comes to the transformation of Munich’s water network in the 19th century. We identify which actors were involved, we elucidate how Munich’s role as residence of the Bavarian Duke and as administrative centre of the state of Bavaria influenced urban water use and we investigate the factors which were responsible for the far-reaching changes of the 19th and 20th century. To familiarize readers with the local particulars, we first provide an overview of the history, the natural conditions and relevant aspects of the legal situation of Munich, followed by the discussion of two temporally distinct patterns of water use and management we have been able to identify. Our study can draw from theoretical concepts but also from previous work on the development of rivers or segments of rivers. The Rhine, the Thames, the Elbe, the Rhône or the Danube have their own biographies (Cioc 2002; Hamlin 1990; Ohlig 2009; Porter 1998; Pritchard 2004; Winiwarter et al. 2013). Numerous urban river histories have been published in recent years. Tarr (2003), for instance, described the environmental history of the Ohio River and its tributaries in Pittsburgh. Olson (2007) compared urban development and waters of Baltimore and Montreal, as the two cities share similar environmental conditions. Nearly all larger rivers in Bavaria have been investigated, such as the Lech, the Iller, or the Bavarian sectors of the Danube and the Inn (Kettemann and Winkler 1992; Krauss et al. 2014; Leidel and Franz 1998). The hydrological characteristics of the Isar are typical of Alpine streams, with a very high discharge (100-year return flood of 1050 m3 s−1 in contrast to 64 m3 s−1 mean flow; Bayerisches Landesamt für Umwelt 2006). Before the Isar was dammed upstream of Munich between 1954 and 1959 when the ‘Sylvensteinspeicher’ was built, the Isar transported large amounts of sediment from the mountains—mostly gravel. The high bedload made it difficult to use the river’s power as it limited the siting of mills. Only smaller branches of the Isar passing the wetlands or streams on gravelly ground formed by the river during the glacial and postglacial periods could be used for this purpose (Rädlinger 2012, pp. 17–22). Floods were a regular feature. Böhm and Wetzel (2006) identified 89 floods between 1300 and 1900 for the Isar up to Munich. High flood frequencies with about one flood every 3 years were observed in the years around 1500, just before 1800 and just before 1900. Minima in frequency, with only one flood within 30 years were documented in the decades after 1550 and around 1700. During the period from 1959 to 2003, the magnitude of Isar floods peaked at 1440 m3 s−1 on 31 May 1940, earlier quantitative data are not available (Böhm and Wetzel 2006). Isar floods originate from long-lasting orographic rainfall and not so much from snowmelt. Therefore, winter floods have always been rare, only circa 10 % of all floods on the Isar occur in winter. Böhm and Wetzel (2006) call for further investigation of the anthropogenic changes in river-bed geomorphology. But even the existing evidence allows ascertaining that floods were a regular threat over the entire existence of the city. The natural features of the Isar were decisive for the development of Munich. The river flowed at some distance from the city, which was therefore spared the regular floods. As it lacked urban tributaries, a dense network of artificial canals had to be built to provide water and hydropower. The canals criss-crossed the city centre and the suburbs along both banks of the Isar. A comprehensive register of urban brooks and canals published in the official Gazette of Munich in 1869 lists a staggering 98 surface waters with a total length of about 72 km (Münchner Amtsblatt 1869b, Nr. 35, 5.5.1869, the list is dated 1 April 1869). In 1314, Duke Ludwig IV was elected Holy Roman Emperor and came to be known as Ludwig the Bavarian. In 1332, Ludwig ordered that all salt from Hallein or Reichenhall that was traded west of Wasserburg, a small town on the Inn River, had to pass directly through Munich (Bauer 2005, p. 82). Bestowed with a mint and market rights and imperial interests in the city, enough money for infrastructure projects was available. Most notably, new city walls were built that would last more than 400 years. This had an important bearing on Munich’s relation to its waters. The city’s big stream (Großer Stadtbach), diverted from the Isar on its left side, branched into two systems of streams with their different arms: the “inner streams”, passing an area within the town walls and the “outer streams”, running through areas with various workshops outside the walls. One of the streams led to a small port near the southwestern city gate from where wood and other goods were delivered to villages southwest of Munich (Rädlinger 2004, p. 15). The Isar’s natural streams followed the curves and bends of the postglacial riverbed. To assure constant, reliable flow of water for all users, they were reinforced and stabilized, in some cases even diverted. Up to the 19th century, the city of Munich depended on this dense net of “Stadtbäche” which by then had been developed into a complicated system of numerous smaller and wider branches of the Isar, bringing water to all parts of the city situated on the lower ground of the postglacial riverbed (see Fig. 1). This water system based on natural branches was likely completed as early as the end of the 15th century. It not only brought water to the many mills and works in the city, to gardeners and launderers but also to private households near the riverbanks. Besides using their water for cleaning, residents living nearby or willing to go for a short walk with a chamber pot used the streams as a natural sewage system. Due to the high groundwater level on the gravel plain around Munich, access to drinking water by digging a well was easy. The abundant private cesspits however threatened its quality. By the 15th century, clean drinking water had emerged as an issue of debate, not just for households, but also for the growing commercial operations. By 1500, Munich had a population of almost 14,000. Among many other water-dependent trades, about three dozen brewers competed for its water resources. Elector Karl Theodor abrogated Munich as a fortified city in 1795, and subsequently, mostly in the 19th century, the walls were torn down, the moats were filled,8 and the remaining small brooks were left flowing freely (Rädlinger 2004, pp. 82–84). Munich’s population grew from 15,000 at around 1650 up to 33,000 at the end of the 18th century and reached 100,000 by 1850 (Heimers 1992, p. 211; Zerback 1997, p. 297). By then, the old city was severely overcrowded and new living space was needed. But this was not a priority of the nobility. The importance of nobility priorities for water use and engineering becomes apparent in the extensive waterworks of the palace gardens of Nymphenburg (built from 1664 onwards) and Oberschleißheim (from 1701, with precursor building from 1597). Lorenz von Westenrieder described the Nymphenburg waterworks in some detail, as he judged them to be the palace garden’s main asset. The park, he wrote, was full of channels, ponds, big and small fountains, some ejecting mighty columns of water, some cooling the air with a murmuring, gentle flow. A channel enabled traversing the entire garden effortlessly on boat, using the natural current created by the topography. Westenrieder also described the statues in detail; among them Neptune and Amphitrite figured prominently, which symbolically connected the garden to water (Westenrieder 1783). Regulation works to straighten the Isar had been underway since the end of the 18th century for better flood protection, which also led to the desired deepening of the riverbed. Subsequently, the former postglacial alluvium was less often and less extensively flooded (Rädlinger 2012, pp. 72–79, pp. 92–110). But the streams remained in these new potential building areas and hindered fast development. The former riverbed near the Isar was badly suited as foundation, and new houses sometimes had to be built across streams. After the first stretch of the Isar was straightened in 1830, the adjoining area was imagined as a new building area. However, as the building of tenement houses in these areas was more expensive and therefore less profitable than in other parts of the city, development started only in the second half of the century in the area around Gärtnerplatz (Rädlinger 2012, p. 87). Constructing big avenues across the Isar such as the Maximilianstraße was difficult because of the unevenness of the terrain and the many bridging structures necessary (Rädlinger 2008, p. 97 f). In Bavaria as in Munich, the progress of industrialisation was slow and only started around the middle of the 19th century. As in many other European cities in the 19th century, the building of railways was decisive for the fate of the city’s stream network (Hartung and Preuß 1996). The extensive network of postal coach routes connecting the residence to the Bavarian territory prefigured the later railway node Munich would come to be. A private railway company had laid tracks from Munich to Augsburg as early as 1838-1840. The company sold the line to the state in 1844. Subsequently, the network was enlarged. By 1851, Munich was connected to Berlin via Leipzig, Hof and Nuremberg, and by 1859, the connection to Vienna was opened. However, river transport did not immediately decrease in importance. In fact, wood demand and wood prices increased with railway construction, as a municipal report shows for 1837 (Piereth 2003, p. 148). Wood rafting on Regen, a tributary of the Bavarian Danube, boomed especially after the 1850s (Knoll 2006, p. 91f). By comparing the pre-industrial history of Munich with respect to the Isar with the situation during the industrial transformation of the second half of the 19th century, we could identify two distinct periods of river and water uses, with different patterns of conflict, attempts at control of water flows and legal disputes and differences in expert groups involved in the transformation of the natural and artificial surface waters. In the earlier period, artificial open waters increased due to the creation of a remarkable amount of mill creeks and canals. In this pre-industrial period, surface water from the Isar and the adjacent groundwater layer were a contested resource. From the beginning of the 13th century, water engineers had transformed the naturally braiding Isar system to meet commercial and private demand. They built weirs to feed natural and artificial canals on both banks of the Isar. The most important ones flowed through the historical centre and supplied a variety of users. Millers and other crafts people depending on hydropower and process water benefitted from technical interventions, just as the urbanites who received drinking water from wells and later from water pipelines supplied partly from springs and partly from bank filtrate. Water from the canals and ponds was also used to quench fires or to supply public baths. Weirs and dams for hydropower and process water supply—erected since the beginning of the 13th century—increased in size and number in several stages. By the first half of the 18th century, a complex system of technical interventions had reached its final pre-industrial state. A large weir (Flaucherwehr) in the south of Munich close to the village Thalkirchen regulated the distribution of water in two main canals—one of them the “Große Stadtbach”—and provided hydropower for milling and other urban crafts. These elaborate constructions required a considerable work force and altered the course of the Isar substantially. Commercial water demand from millers, dyers, tanners, bleachers or powder mills had increased as early as the 16th century, when fluvial dynamics caused the Isar to shift towards the east, away from the city centre. The expertise of an unnamed Tyrolian expert helped to build large overflows. Millers fighting for their main energy source even erected new dams. The struggle against the shift of the river lasted for centuries and the distribution of water remained problematic until the 19th century (Rädlinger 2012, p. 48 f, 52 f). Water abstracted by weirs and overflows not only drove mills and other enterprises. It also supported the transport of firewood from forests near Munich or further away. Wood came especially from the Duke’s forests near the Isar or along the river Loisach and was floated downstream as loose logs or rafts. Logs were collected at a large grill erected south of the city across the main branch of the Isar between 1585 and 1587 by Hans Reifenstuel, a Bavarian engineer employed by the court’s building authority. After 1606, a new canal was built to move the logs into a large pond with several compartments (Holzgarten).Water could be drained after they had been filled with logs and the logs could dry before they were stacked into piles on the riverbank. Wood not needed by the court was sold to the inhabitants of Munich (Rädlinger 2004, p. 48 f; Rädlinger 2008, p. 37). The collecting grill was a solid, durable construction, serving simultaneously as a bridge leading to a small island. Soon after 1600, this bridge was extended and a water pipeline was added, which provided water from the eastern bank of the Isar to the Duke’s court. For the people bringing rafts or logs to the city, this new construction was a barrier where they had to wait until it was opened to let them pass. This allowed the court to control the toll that might have been evaded at the city’s port (Rädlinger 2008, p. 37 f). Rafting was economically important. In 1809, a daily stream of rafts of considerable size transported coal, sand and millstones, but also beer and fruit into the city. In the city, piles of firewood were heaped on the rafts. Dismantled rafts themselves became a source of wood, which could then be moved further downstream for sale (Klebe 1810, p. 21). After 1685, a series of new dams and overflows was built to redirect a large part of the discharge to the left branch of the Isar, which was called “Große Isar” (Large Isar) from then on. Banks were reinforced to stabilize the larger branches and the islands in between. The “Große Isar” became a better waterway for rafts and log booms. Water was also diverted into the court’s works south of the city centre, and further downstream into the artificial log-driving canal and a canal for the hammer mill (Rädlinger 2012, pp. 42–45). Like the “Flaucherwehr” these new dams and overflows reshaped the riverbed, which now consisted of two larger arms and two large stable islands. The demand for hydropower, process and drinking water, for ducal display, defense, waste and wastewater discharge led to conflicts related to water quantity and quality. Water quantity was limited and technical structures supported some trades but impaired others, so harmonizing requirements was always a challenge. Water quality was a matter of concern, too, because the function of natural arms and artificial canals as open sewers resulted in pollution with adverse effects on drinking water, washing or even gardening. Complaints by physicians and inhabitants about the deteriorating water quality are documented already for the early 17th century. None of their suggestions for remediation was implemented.15 Munich’s “Stadtbäche” were too important to be abandoned. Most crafts depending on hydropower and water, but also important components of the transport and water supply infrastructure, would have collapsed without the flow of the streams and canals. In the 18th century, only a few smaller streams were put underground, into culverts made of brick, and only very few were abandoned. The majority of streams and canals remained open (and smelly) to meet the various urban needs. In addition to these conflicts, Munich’s status as the residence of the Dukes of Bavaria caused intense disputes between the urban government and the court in the Early Modern period. Disputes were taken to court, especially about the competences of the court and the city with regard to water rights (Rädlinger 2004, p. 22). After the end of the 15th century, ducal attempts to increase control of urban waters were apparently successful. Most new projects using hydropower were initiated by and for the court; court-employed specialists carried out most technical interventions. On the right side of the river Isar, close to the village Au, but especially east of the residence, in the “Lehel” on the left side of the Isar, a lively commercial district of the court had evolved by the 18th century. Here, the riverbed of the Isar was wide and consisted of several river arms. A canal was dug for a spice mill, another for a hammer mill. Being at the centre of the economic interests of the powerful feudal enterprise of the House of Wittelsbach was a mixed blessing for Munich. With the extension of the court’s economic activities, the city lost tax income and initiatives to promote the municipal economy gradually decreased (Rädlinger 2004, p. 46 f). New works for the city such as well houses or waterwheels for artisans could still be established at existing streams, but only up to the physical limit set by hydropower. For the court’s area in and around Lehel, water was diverted from a natural branch of the Isar to the Duke’s stables and gardens, later to a new garden and pond with fountains of Elector Maximilian I. (Rädlinger 2004, p. 163, p. 167, pp. 42–44). Millers and other artisans strongly opposed the use of a stream’s hydropower for ostentatious display, as this did in no way support public welfare. Sometimes, courtly constructions were even destroyed during the night (Rädlinger 2004, p. 45). To make matters worse, the Duke set an example to follow. Soon, other noble families would build ponds and fountains in their parks. Apparently, the erection of fountains was one of many areas where conflicts over water were played out.16 This pattern of conflict prevailed well into the 19th century. When the seasoned public servant and jurist Jakob Bauer was elected mayor of Munich in 1838, the tensions again became apparent. They help us shedding light on the role the Isar and the water network played in local power struggles. Bauer fought for the autonomy of the city against the reigning Wittelsbach princes’ state of Bavaria with their so-called “Kuratelbehörde”, a controlling administrative body. He claimed that the representative buildings of the monarch were expensive; the city was forced into co-financing them although they did nothing to foster common welfare, whereas the projects of the magistrate were of common interest and benefit. Waterworks were one of his main examples. The city, Bauer claimed, had invested not only in wells and water pipes and a new bridge towards the village of Au, but had also regulated the Isar (called “Einbettung”), whereas the royally dominated “Verschönerungskommission” (city beautification commission) had not even budgeted the necessary underground sewage for downtown when planning a new avenue, the Ludwigstraße (Zerback 1997, pp. 162–164). Summing up, the great diversity of commercial and private water uses was the main challenge of pre-industrial water provision in Munich. Burghers, state administration, the ducal court and courtiers with their different economic interests and different approaches toward the use of river water competed for water. Control over water in itself became a means of negotiating one’s role and place in the hierarchy. But maintaining and harmonizing a variety of water uses was a prerequisite for urban life and urban development in Munich and it was not possible to replace them with other technical means or to tap distant resources. Basically, all demand for water as substance and energy carrier had to be satisfied locally. Supplying different water users had led to substantial modifications of the Isar in and around Munich. Large and small weirs, overflows and dams erected by the town or by the court diverted water into a complex network of natural river arms and artificial canals, which was built piecemeal, and hence, did not result in a consistent, optimized and integrated overall layout. A multitude of constructions with a considerable variety of design and function was the result. Artificial inlets improved water supply at several locations along the canals, outlets removed excess water not required for commercial purposes. Ponds for collecting wood, keeping fish or supplying fountains were another part of urban surface waters, which, despite obvious shortcomings, were considered a benefit by the town, the duke and the court alike. When the Munich Magistrate issued the above-mentioned inventory of official names of all water bodies in the city, complete with their length, width and location in 1869, the list comprised 98 distinguishable streams, canals and parts of streams of which 84 were on the left, the city side (Münchener Amtsblatt 1869b, Nr. 35, 5.5. 1869). Throughout the centuries, the city’s actors had mainly engaged in aboveground water engineering projects. In the 19th century, emphasis of debates and activities shifted towards subterranean sewers, an issue where Munich was rather a latecomer than a forerunner, and to the creation of pipelines for drinking water. Although some of the pre-industrial water pipelines were supplied with clean water from sources, most of them tapped groundwater and especially bank filtrate from the Isar (Baader 1824). According to some scholars, modernization is a process of making major parts of infrastructural dependency invisible. Bruno Latour has used an experimental approach to emphasize how modern Paris is permeated by interacting channels of gas, electricity, water and sewerage, a silent, sometimes dangerous web of hidden interactions closely watched by engineers, supervisors and accountants. He emphasizes that the connections often remain hidden (Latour and Hermant 1998, p. 91). Sewers are among the most prominent examples, as they became to be associated with dirt, danger and the unseen (Gandy 1999). As Matthew Gandy has aptly summarized, the fast-growing, industrializing cities would become ‘modern’ by changing their relation to water as the epitome of nature in the city. ‘The changing relationship between water and the human body in the modern city reflects a distinctive “hydrological order” characterized by the extension of complex technological networks, changing patterns of everyday life and the establishment of new modes of municipal administration. Water, like other facets of urban nature, was incorporated into an increasingly rationalized and scientifically managed urban form.’ (Gandy 2006, p. 14) In Munich, water demand remained as diverse as in the previous centuries over large parts of the 19th century, while needs intensified and new types of uses were established. Pollution became a main concern for many of them, including bathing and hydropower (Bernhardt 2001; Büschenfeld 1997). The increasing awareness that cleanliness was an important health factor had effects on private water use. Whereas, contrary to common misconceptions, rural customs included regular, if infrequent, washing of the body, Early Modern urban dwellers had started to view water, almost like the miasma-containing air, as a potential health threat, using perfume instead of water to quench the odours that were considered dangerous (Corbin 1988). Around 1800, cleanliness as well as bathing became more popular among city populations, but displaying the body was considered more and more vulgar and later as amoral. Bathing was banned from sight to private rooms, preferably a bathroom, or in rather exclusive and expensive baths situated at the river Würm and its branches with their warmer water.17 Bavarian authorities tried to instil the need for cleanliness also indirectly by teaching swimming to the military as well as to schoolboys, students and apprentices. During the first half of the 19th century, several baths with swimming schools were opened close to the streams in and around Munich.18 Most were built exclusively for men but more secluded facilities for women existed, too. In 1847, the city of Munich opened a public swimming bath for men on the right bank of the Isar. Water was taken from the main branch of the river. In 1877, a bath for women opened on the left bank of the Isar, with water supplied from the “Großer Stadtbach”.19 These two baths were among a series of municipal projects to provide more places for Munich’s residents to swim. The Municipal Gazette of 1869 listed 13 baths, of which five were officially designated as swimming baths (Münchener Amtsblatt 1869a, Nr. 3, 10.1.1869, p. 43). Just like hydropower, wood transport on the Isar intensified throughout the 19th century. Batsch’s description of Munich from the beginning of the 19th century emphasizes the critical role of the Isar for provisioning the town with much-needed wood (Klebe 1810, p. 21). After 1850, new landing places had to be found for the several thousand rafts arriving in Munich annually. This number exceeded the capacity of the small port near the inner city. In addition, urban development came along with new streets and grand boulevards on the left bank of the Isar. Instead of the previously common inclined bank reinforcements, vertical quays were erected to provide more space and to improve flood protection. The old port for rafts had to be abandoned and was moved for a few years to the southern side of the main bridge across the Isar (Rädlinger 2012, pp. 123–126). In 1898, the city administration decided to build a new and larger landing area south of Munich. It was connected to the Isar via a new rafting canal and became the only port of Munich after the small waterway to the southwest of the inner city had been abandoned. The growing pollution of surface and groundwater affected and increasingly hampered most types of water uses and was a health threat in the 19th century (Münch 1993, pp. 126–133). Streams and canals in Munich and Au had long served as open sewers. The town’s privies were usually situated near a cesspool, which was emptied after some years of use. Only very rich people could afford culverts from their privies to the next stream. Residents in larger buildings such as monasteries or prisons dumped their waste directly into passing streams, as they had in the 18th century. Cleaning pipes and culverts with water from the pipelines was regarded too expensive. Rainwater and the discharge of canals were supposed to be sufficient. In dry summers, this cleaning system failed and the smaller streams exuded an awful stench.23 In addition to sewage released from private houses, surface waters suffered from the growing industry, from new manufactories such as weaving and spinning mills, paper mills or porcelain-making plants. Groundwater and water from well houses was polluted, too. Especially the well houses located along the moat between the city gates Isartor and Karlstor were reported to deliver turbid and unhealthy water (Huber 1820, p. 6). As in many other European and North American cities, public discourse in Munich, in part reflecting the growing impact of the medical profession on public policy, centered more and more on water quality (see e.g. Hamlin 1990, 1993; Melosi 2000; Tarr 1996). Nauseating odor and hygienic problems in the inner city caused by polluted surface waters were increasingly regarded as intolerable. The cholera outbreaks, which hit Munich in 1836, in 1854 and especially in 1873, increased the perceived urgency for action. The epidemic of 1854 had its origin at the venue of an industrial exhibition. Visitors hastily left the town. The famous “Oktoberfest” was cancelled. Munich was branded as a “dangerous city” which no tourist should visit, as typhoid fever and cholera raged. Tourism had started to become an important factor for the city’s income. In the 1870s, the numbers of visitors declined, and according to a contemporary report, officers abstained from promotions to avoid having to move to Munich (Münch 1993, p. 134). The famous Munich physician and epidemiologist Max von Pettenkofer studied the causes of cholera (Münch 1993, pp. 128–129). He mapped the casualties and discovered that poorer regions suffered more than the less crowded areas with bigger houses. He also found that a great number of illnesses and especially typhoid fever spread along the city’s streams. As he adhered to the miasmatic theory of disease, Pettenkofer concluded that in poorer regions, the earth was polluted with gas originating from excrement and that this gas was lethal.24 Despite assuming that cholera was created by emanations from unhealthy soil, a theory that would later prove to be wrong, he drew a connection between tainted water, soils, and air and the cholera outbreaks (Pettenkofer 1855; Winiwarter et al. 2016). Although urban authorities—who subscribed to Pettenkofer’s opinion on the origin of cholera—focused on clean air, the condition of surface waters played an important role in the debates. After Munich had become the capital of the kingdom of Bavaria in 1806, its growing importance as the only residence of the sovereign resulted in attempts to improve and embellish the town center. Rain drains were to be rebuilt properly and open gutters for rainwater were to be moved underground. These gutters soon were filled with waste and became clogged. One of the most fashionable new quarters that developed in the north of the inner city was claimed by King Ludwig I as his special zone of interest. But whereas his new monumental buildings along the Ludwigstraße and around Königsplatz were the source of Munich’s fame as a tourist attraction, very little money was put into the sewage system or other hygienic improvements, as the disillusioned mayor Jakob Bauer had rightly complained. In 1864, the city of Munich forbade discharging chemicals and smelly liquids into the city’s rivers even in small quantities without a special permit. But as these permits were given generously after the polluter had assured authorities of the proper dilution of the waste with drinking water or water from a river, the city of Munich decided in 1877 to allow the release of poisonous liquids again. Permission, however, was restricted to permanent rivers.28 After 1869, new water closets had to be built with a special sieve that collected solid matter in small containers, which had to be emptied separately outside the city. But most of the city’s closets were old and their owners were not forced to build new ones. After having gained more municipal autonomy in 1869, the commune had the necessary financial means for improving the sanitation of the city. Joseph Gordon—an English engineer who was involved in British urban sanitation projects and had been responsible for the construction of Frankfurt’s sewage system in 1866—was invited by the city of Munich in 1881 to design a comprehensive sewage system for which construction started in the same year (Allen 1904; Elliott 2013; Varrentrapp 1868, p. 3 ff). The pipes should be cleaned with drinking water or clean water from the city’s streams and all the waste and refuse was to be carried into the Isar. The residents of Freising and Landshut downstream of Munich protested especially against the release of excreta into the sewers, as they were afraid that the water they would receive would be even more polluted than before. In addition, the controversy between the advocates of sewage systems and those pleading for collecting excreta was not yet resolved. The final decision of the Magistrate to include excreta into the sewers was taken only in 1892 (Münch 1993, pp. 207–225). All wastewater was released into the Isar without further treatment before the first sewage treatment plant opened in 1926. For almost 30 years, Munich relied on the self-cleaning properties of the river, sharing this convenient misconception with many other urban centres. As with the sewage system, improving the supply of drinking water was imperative, as it still originated from well houses around the city throughout the first half of the 19th century. After 1848, complaints about low quality became more frequent. Many of Munich’s inhabitants were not able to pay for tap water and received their water from one of the many public or private wells. In densely populated areas, the ground was polluted from dumps. Refuse from artisans and small industrial sites caused further deterioration of drinking water quality. New well houses in the surrounding rural area provided no solution, which became apparent especially after the third cholera epidemic in 1873. In some of the modern building areas, as in Ludwigsvorstadt, people had to rely on water from wells as late as 1875, as the district had no access to a water pipeline. Until a new canal was built to the well house for Munich’s main hospital and other smaller institutes in this urban quarter, the supply of water was scarce and patients had to drink purified water from the nearest stream.29 The demand for clean drinking water in sufficient quantity was finally met in 1883, when a new pipeline from the Mangfall was opened.30 It also remedied the local sewage problem, as it provided enough water to clean the system. As in other urban centres, the sewage and drinking water system built in Munich in the 19th century was shaped by newly established expert groups. Physicians and epidemiologists had started to discuss the status and use of Munich’s waters already in the 18th century.31 In the 19th century, they became essential for planning the city’s sanitation infrastructure although they disagreed on the origin of waterborne diseases and hence their suggested mitigation measures were contradictory. In Munich, Max von Pettenkofer’s influence delayed the acceptance of the bacteriological concept of disease as advocated by his adversary Robert Koch. The register of streams and canals that was drawn up by the city authorities in 1869 listed almost one-third of the originally approximately 72 km sometimes natural, but mostly artificial surface waters, as vaulted, covered with buildings or otherwise made inaccessible. Only one new water body, the rafting canal built in 1898, would be added before this elaborate network of aboveground waters would mostly vanish, either by becoming part of the sewage network or being filled in. It was technically relatively easy to abandon artificial waterways, once their former uses had become obsolete due to other infrastructures preforming the task. Munich was no Venice or Amsterdam, but had once been more similar to them as one would be able to imagine now. This dramatic transformation of a pre-industrial stage, when the urban centre was criss-crossed by aboveground artificial waters makes the case of Munich unique: many actors had driven canal building. Diverting water from the Isar into artificial canals was a source of increased revenue for the landlords as well as a means to strengthen fortifications and boost communal income. The nobility, with the ruling Wittelsbach family at the forefront, could display their power by diverting water for their fountains, but the multiple and conflicting uses also offered the chance for other actors in the city to stake claims and profile themselves vis a vis others. The fate of the “Stadtbäche” clearly shows the peculiarity of Munich’s water history. As soon as hydropower and water supply could be satisfied from other sources than local waters, the many artificial canals could be abandoned comparatively easily. After the outlets and weirs were removed, the water disappeared and the canals could be filled in. In many other European cities, as for instance in Vienna or in Brussels (Pollack et al. 2016; Deligne 2016), where water supply depended on natural streams until the late 19th century, abandoning them was not possible. The streams remained to be part of the hydrological system. Only the mill creeks could be filled in, as happened in Vienna (Pollack et al. 2016). Munich does not quite conform to the phases Kaika (2005) describes as a general pattern of modernization of cities based on the cases of London and Athens. In Munich, the ambition to control nature’s water flows stems from a much earlier time. The boundary between natural and artificial waters had been blurred in Munich in the 13th century, and from then onwards, urbanites had to continue their interventions and maintenance efforts, thus bearing responsibility for what they could never fully control. Munich fits into the general pattern as far as hygienic concerns were becoming widespread and mounting pollution became a recognized problem in the beginning of the 19th century. By the first decades of the 20th century, most of Munich´s preindustrial water network had become subterranean or abandoned. Larger remaining canals, most notably the Große Stadtbach, were transformed into hydroelectricity producers. But this was transitory at best, as electricity became a transportable commodity and coal superseded water in power production. Already when electrical engineering became widely known in Munich with the International Electricity Exhibition of 1882, electricity for the exhibition hall came from hydropower transported over 57 km from Miesbach, where a waterfall had been tapped. As in many other European places, Munich’s first power plants—the Muffat- and the Maximilianswerk opened on the right side of the Isar in 1894/95—depended largely on coal, aptly demonstrating the new role of fossil fuels for energy supply. Fossil fuel and its conversion into electricity via generators made the city dependent on other sources of energy than the local waters. The railway was the second invention with a strong bearing on Munich’s waters. When the new harbour for rafts and ships opened in 1899, Munich was already linked to several railway lines, connecting the city with other eastern or western centres of trade. Transport of goods increasingly shifted to this cheaper and easier mode of transport and the Isar gradually became insignificant as a transport route. As the transport of lumber also was taken over by the railway, the collecting grill was removed, the log driving canal and the Holzgarten, one of the landmarks of the city, were filled in 1881 (Rädlinger 2004, p. 109 f; Rädlinger 2012, pp. 137–139). This is similar to the history of the Wiener Neustädter Kanal in Vienna, which also became redundant soon after its opening due to the competition of railways (Hauer et al. 2016). What had been unimaginable to Batsch in the 1820s, a complete independence of Munich’s inhabitants from their local water network, had become possible by the combination of infrastructures we have come to call “modern” and by removing the artificial waters which constituted the early modern water network. The provision of electrical energy from remote hydropower and other types of power plants, transportation services by rail and later on by road powered by fossil fuels, and a reliable hygienic water supply with abundant amounts transported over considerable distances combined with sewage channels and technical water purification systems had made it possible for parts of the inner city to be treated as tabula rasa. But the neighboring Isar was still a force to be reckoned with. Flood protection remained a concern, as did river pollution, problems that would be solved or at least alleviated no earlier than in the second half of the 20th century. Flood protection means not just dams, but also protection from rising groundwater levels during high water. The famous museum of technology, the ‘Deutsches Museum’ is situated on an island between branches of the Isar. It stands on 1500 pillars in alluvial ground. During floods, water wells up from the ground, permeates the walls and particularly threatens the underground museum mine. Reacting to the flood of 2013, an ambitious project has been started to protect the museum ‘once and forever’. A white tank made of 720 m liquid concrete shall now be built to protect the museum (Süddeutsche Zeitung 2015, http://www.sueddeutsche.de/muenchen/menschen-am-fluss-wie-ein-schweizer-kaese-1.2639148). Environmental historians in the 22nd century will in all likelihood describe the unwanted consequences of this and other interventions and show that the conquest of urban waters is impossible. Dealing with urban waters is a continuous process of interacting with ever-changing natural systems. Examples in StadtAM, Bäche und Gewässer 313; Statistisches Amt der Landeshauptstadt München (1894, p. 62), quoted after Rädlinger (2004, p. 92). For this typical choice of location and subsequent development of towns see Glauser (1978); geological and geophysical conditions in Frank et al. (1983, pp. 15–32). For an historical overview, consult Bauer (2005); Zerback (1997, pp. 23–26) offers a very useful overview of the historiography. Gimpel (1980, p. 17), quoted after Rädlinger (2004, p. 18). Dirr (1934, p. 260), art. 135, around 1300, quoted after Rädlinger (2004, p. 18). Workmen built a so-called “notferte”, see Dirr (1934, p. 134) f, 12 March 1330, quoted after Rädlinger (2004, p. 68); see also Vangerow (1960). Betz (1959); Gilardone (1935); both quoted after Rädlinger (2004, pp. 53–58). Stahleder (1995) gives an overview. The disputes and fights between town-millers and millers in Au in: StadtAM, Tiefbauamt 51/1; Freudenberger (1927, pp. 174–177), quoted after Rädlinger (2012, p. 48). About disputes among millers in Munich and the complicated system of obligations and payment Kohl (1969, p. 118 f, p. 124), quoted after Rädlinger (2004, p. 71). StadtAM, Wasserwerke 1; Solleder (1938, p. 369); Stahleder (1995, p. 426) f. quoted after Rädlinger (2004, p. 37). Schattenhofer (1974, p. 12); quoted after Rädlinger, (2004, p. 37). Henle (1912); Wieland (1988, pp. 60–65), quoted after Rädlinger (2004, p. 39 f). More on this process experienced in most communities at the time: Stahleder (1992, p. 143). Michel (1983, p. 48) f; Ponten (1928, p. 324); both quoted after Rädlinger (2004, p. 59); see also Ongyerth and Römisch (2004). StadtAM, Tiefbauamt 20/I, 6.10.1611 and 27.10.1634; BayHStA, GR 303/2, Seuchenmandate; ibid. GR 304/4, expertise Malachias Geiger; all quoted after Rädlinger (2004, p. 79). StadtAM, Tiefbauamt 20/I, quoted after Rädlinger (2004, p 44 f). Neubauer (2001, p. 111 f, p. 129 f), quoted after Rädlinger, (2004, p. 96). Baumgartner (1805, p. XXXIX); Megele (1951, p. 19, p. 21); Neubauer (2001, p. 90); all quoted after Rädlinger (2004, p. 98); Rädlinger (2004, p. 97 f). StadtAM, Badeanstalten 24; Megele (1951, p. 19) f; both quoted after Rädlinger (2004, p. 100 f). StadtAM, Tiefbauamt 15; StadtAM, Plansammlung C 85; both quoted after Rädlinger (2004, p. 104 f). Kortmann (1966, p. 11), quoted after Rädlinger (2004, p. 106). Kleemaier 1983, p. 91, quoted after Rädlinger (2004, p. 106); Rädlinger (2004, p. 106 f). Oefele (1874, p. 344), quoted after Rädlinger, (2004, p. 25); Rädlinger (2004, p. 25); StadtAM, Tiefbauamt 20/I; ibid., Tiefbauamt 739/I, both quoted after Rädlinger (2004, p. 63); Rädlinger (2004, pp. 63–67). Vasold (1991, p. 232) and Münch (1993, p. 128 both quoted after Rädlinger 2004, p. 87 f). Mayer (1999, pp. 311–328), quoted after Rädlinger (2004, p. 63). StadtAM, Tiefbauamt 739/I; Lösch (1951, pp. 3–5), both quoted after Rädlinger, 2004, p. 86; Stadtentwässerung, p. 12, quoted after Rädlinger, (2004, p. 87). StadtAM, Tiefbauamt 749; Stadtentwässerung, p. 15; Münch (1993, p. 129); all quoted after Rädlinger, (2004, p. 88). StadtAM, Tiefbauamt 742, Ortspolizeiliche Vorschriften über die Einleitung in die Isar und in die Stadtbäche § 1, quoted after Rädlinger (2004, p. 91). Münch (1993, p. 125, p. 131); Henle (1912, p. 22); quoted after Rädlinger (2004, p. 93 f). Unlike Innsbruck where the city’s sanitation program might have been realized primarily for tourists (see Dietrich 2000), in Munich tourism was only one factor. StadtAM, Tiefbauamt 20/I, 6.10.1611 and 27.10.1634; BayHStA, GR 303/2, Seuchenmandate; ibid. GR 304/4, expertise Malachias Geiger, all quoted after Rädlinger, (2004, p. 79). Münch (1993, pp. 217–221); Verwaltungsbericht 1905, Beilage V, p. 11; Verwaltungsbericht der städtischen Kanalisations—Anlage, 1902, p. 9, all quoted after Rädlinger (2004, p. 90); Rädlinger (2004, pp. 89–91). With emphasis on the situation in Prussia see Büschenfeld (1997, p.166–185). StadtAM, Abgabeverzeichnis 101/1, nr. 26, quoted after Rädlinger (2012, p. 162); Zell (1949, p. 17 f, p. 30 f), quoted after Rädlinger (2012, pp. 158–161); Bosch (1909–1910, p. 10, p. 19, p. 370) quoted after Rädlinger (2012, pp. 159–163); Rädlinger (2012, pp. 158–163). The Dreimühlenbach in Hickethier (2000), quoted after Rädlinger 2004, p. 112). Open access funding provided by University of Klagenfurt. This paper is a product of the Project “URBWATER—Vienna’s Urban Waterscape 1683–1918. An environmental history.” funded by FWF, the Austrian Science Fund, Grant No. P25796-G18. It originates from a Workshop held in Vienna, where Christine Rädlinger presented her publications on the Isar and Munich. This paper would not have been possible without her work. We are deeply grateful that she took the time to present her work in Vienna and subsequently gave us access to it in written form. Prof. Martin Knoll, University of Salzburg, offered several very important and helpful comments, and we are very grateful for his support. Prof. Richard Unger, UBC Vancouver, not only made valuable suggestions but was also kind enough to provide language editing.